A new Harbinger Renegade four-part mid season story arc “Massacre”, commences this summer. The event is serving as a lead in to 2018’s Harbinger Wars 2, which is being planned by Valiant Comics as we speak. 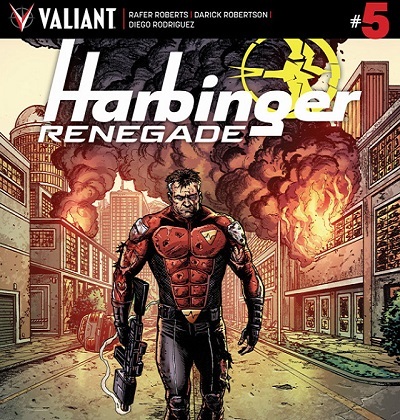 If you are following the series then you will know that at this point in the comics the Harbinger Renegades are now reunited, which is just what Alexander Solomon has been waiting for. Solomon is psiot with the ability to predict the future, with the team now in place the next phase of his scheme can begin. But, there are more people on the tail of the Harbinger Renegades. Major Charlie Palmer has just ordered a new division of the militarized H.A.R.D. Corps to track down the psiots. Peter Stanchek, Toya Harada, Faith, Imperium, Torque and the other renegades will be up against a firefight across the public streets of a major metropolitan city. The “Massacre” miniseries should offer some insights into what will be happening in Harbinger Wars 2 next year. Writer Rafer Roberts (Plastic Farm) and artist Darick Robertson (The Boys) are designing the series action, Roberts has stated that the direction of this season has been mapped out from the beginning and that we should expect major developments. We are also informed that the character who will be the primary antagonist in tthe 2018 series will be revealed. The Road to Harbinger Wars 2 will begin in issue #5 of Harbinger Renegade, which will be released in July.